To be fair, I felt the floor of my apartment, and the four floors below it, move under my feet. The earth was down there somewhere. It moved. My apartment just kind of wobbled. But yes, you read that right: I SURVIVED EAST COAST QUAKE 2011. Of course, my number one thought was not: "Am I okay? Are my pets okay? Is the city okay?" Nor was it even, "Has this shown up on twitter yet?" My number one thought was: "How will this affect my long run?" and its corollary, "Does this mean I don't have to do my long run today? Is it even safe?" Yeah, of course it was safe. So I did my long run. It was a gorgeous day and a good, solid run. I ran about 8m down the West Side Highway to meet up with Tara near her office, and then she and I ran back up to the Upper West Side. But... the run wasn't long enough. That's been the story of this marathon training cycle. My past four or five long runs have all been around 13m, and this weekend will be the same (I'm running a half on Sunday). I wanted to do 15m, but between leaving late (I got an important phone call right as I was walking out the door - why are those always bad news?) and not having a good sense of how long things take me, by the time Tara and I parted ways it was already dark out. I don't like running in the dark, so I got on the subway. The marathon will be fine - as long as I get my act together and up my long runs. I'm not training for a half, after all. I only got very nearly hit by two bikes during the run, so I consider it a success. That, and it was also oddly fast (for me). I have found that I'm fastest in the late afternoon/early evening. 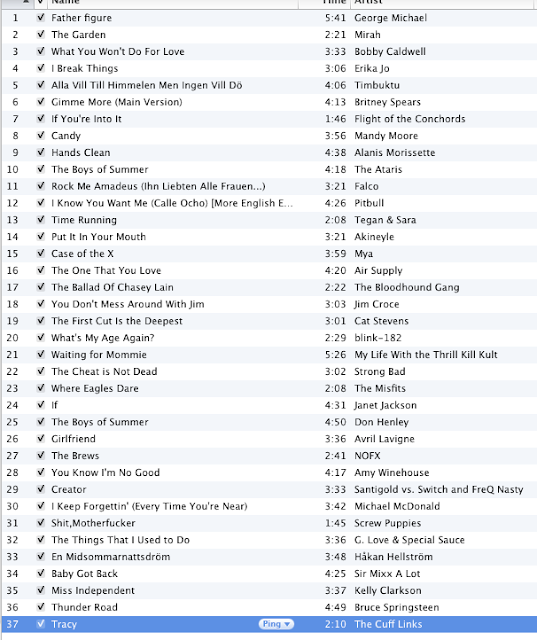 I'm not usually an "OMG here's my playlist!" girl. You can choose your own music or, better yet, go without music. But when I walked out of the apartment, iphone in pocket, I decided I wanted to listen to music. I found a mix on my phone labeled "marathon" and I started it up. Can I tell you how much it rocked? Yes, or I can show you. The best part? This isn't all of it! There's more music left on the playlist for another run! I stand behind it all as awesome, even the two versions of "Boys of Summer." Especially those, in fact - it's the perfect time of year for that song. I will admit to feeling kind of old when Blink-182 started, remembering that my brother and sister played me that song on my 23rd birthday... a decade ago. But! The Cheat is Not Dead (you either get it or you don't). put it in your mouth??? bwahahaha I haven't heard that song since college. I love it. and the entire playlist. Kelly, I *love* that you know that song! And Christel... you should see the musical. It's amazing. I love that you have FOTC on your playlist. And one of the cutest songs, too. Also, Homestar Runner! 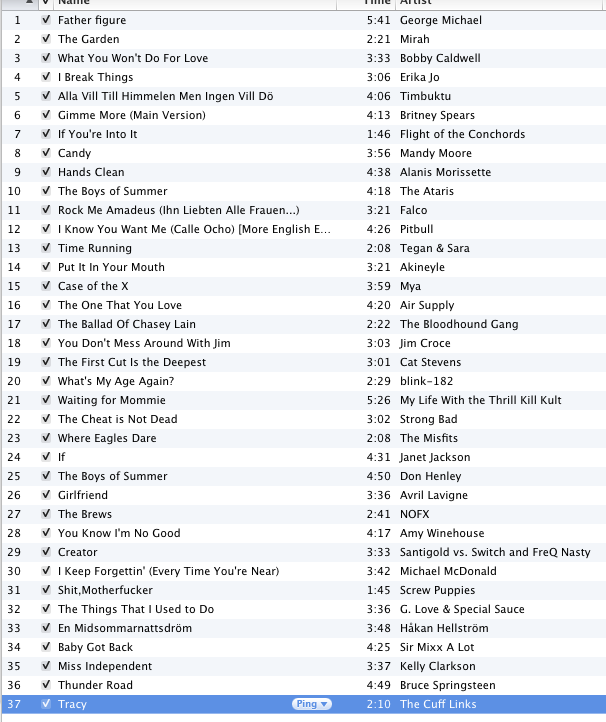 Dude, this is, hands down, the best running playlist I have ever seen. The Cheat is Not Dead! Multiple versions of Boys of Summer! Air Supply! I might be a little bit in love with you right now. And HOW did I miss Coed Prison Sluts when I lived in Chicago? I'm not sure I'll ever forgive myself for this one. I am SO glad that you guys appreciate Homestar Runner. And Dawn, I think that Co-ed Prison Sluts might not have been playing while you were in Chicago? I saw it a few times in high school/college and then again a couple of years ago, but the recent times were part of a revival/reunion - so it must have closed for a while. Mandy Moore, "Candy" = genius. And I like your shirt.